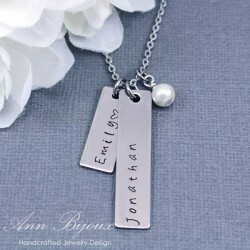 Hand Stamped Name There are 20 products. 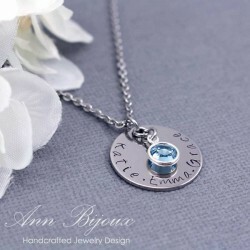 Materials: Stainless Steel Disc, Stainless Steel Flat Cable Chain, Sterling Silver Charm, Swarovski Birthstone * How to order * 1. Please select chain length & number of birthstone from the drop down list. 2. Please type name you want to stamp in Product Customization below. ( ex : Katie, Emma, Grace ) The Product Customization is at the bottom. 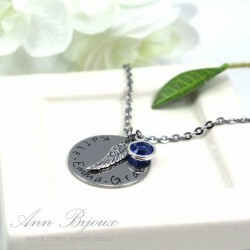 Materials: Stainless Steel Disc, Stainless Steel Flat Cable Chain, Swarovski Birthstone * How to order * 1. 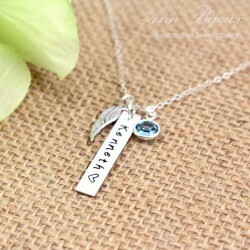 Please select number of birthstone & chain length from the drop down list. 2. Please type name you want to stamp in Product Customization below. ( ex : Katie, Emma, Grace ) The Product Customization is at the bottom. Materials: Stainless Steel Disc, Stainless Steel Flat Cable Chain, Swarovski Pearl * How to order * 1. Please select chain length from the drop down list. 2. 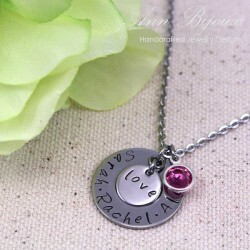 Please type name you want to stamp in Product Customization below. ( ex : Jonathan, Emily ) The Product Customization is at the bottom. 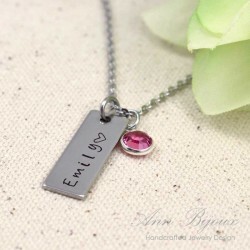 Materials: Stainless Steel Bar, Stainless Steel Flat Cable Chain, Swarovski Crystal Birthstone * How to order * 1. Please select chain length & birthstone color from the drop down list. 2. Please type name you want to stamp in Product Customization below. ( ex : Emily ) The Product Customization is at the bottom. 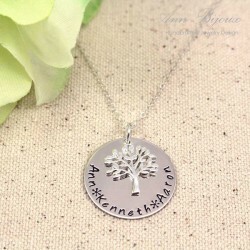 Materials: Sterling Silver Disc, Sterling Silver Charm, Sterling Silver Chain * How to order * 1. Please select chain length from the drop down list. 2. Please type name you want to stamp in Product Customization below. ( ex : Kenny, Jenny, Aaron ) The Product Customization is at the bottom. 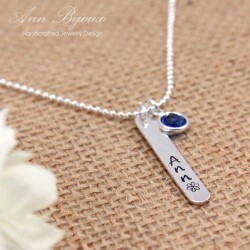 Materials: Sterling Silver Bar, Sterling Silver Ball Chain, Sterling Silver Element, Swarovski Birthstone * How to order * 1. Please select length & birthstone from the drop down list. 2. Please type name in Product Customization below. ( ex : jenny ) The Product Customization is at the bottom.